This article talks about hard drive interface and in what occasions they will be used. Finish reading this article, and you'll understand hard drive jargon like IDE, SATA, SCSI, etc. 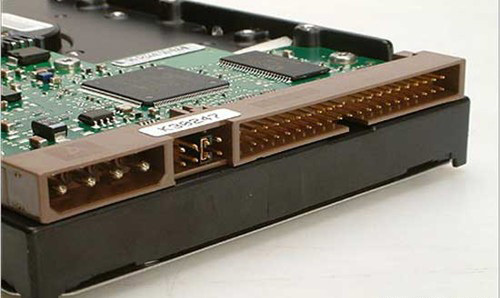 In a common way, hard drive interface refers to the connection method used by hard drive to communicate with computer, and different interface has its own features and usage scope. Most hard drives use IDE and SATA interfaces. IDE emerged earlier than SATA. A couple years ago, many hard drives were produced with IDE interface, but now, SATA hard drive has nearly taken the place of IDE drives. You can open the computer case, disconnect hard drive and see its interface. The hard disk interface in the picture above is IDE. The interface is divided into three parts, i.e. power connection, jumpers and IDE interface cable, from left to right. Power connection is used to connect power cable of computer, and IDE interface cable should be connected to motherboard. If there are more than one hard drives on the computer, we'll need jumper to set primary/secondary hard drive. The above is a picture of SATA connector on the back of a hard disk. Externally looked, SATA is in a much different way from IDE. The narrow interface on the left is SATA interface connector, and the relatively wide interface is power connector. Many SATA hard drives do not use jumpers and don't use jumper to set primary hard drive either. To set primary drive, you can access the settings from computer BIOS. Jumpers are mainly used to set data transfer rate, which will be explained in details. Also, some SATA hard disks have the interface for firmware updating. Technology continues to evolve from now till eternity. The main reason that SATA replaces IDE and dominates the market is that SATA has much better performance than IDE. Put simply, the speed of the SATA interface is much faster than IDE drives. 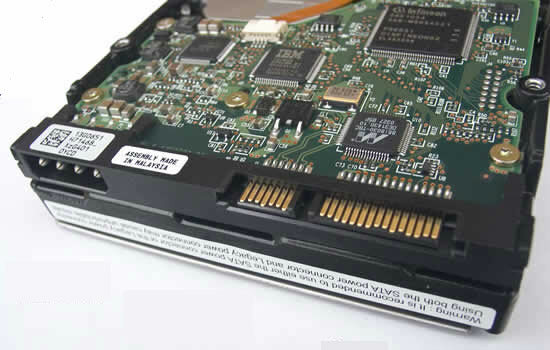 There are converters that can convert IDE to SATA or convert SATA to IDE. If the motherboard of an old computer doesn't support SATA, and such converter can help you convert SATA hard drive to IDE interface, and vice versa. As has mentioned in previous part, SATA hard drive dominates present market. Hard drives in your computer must be SATA interface. Thus, we'd like to make a further discussion of SATA interface. There are currently three versions of SATA: 1.0, 2.0, and 3.0. Larger version number comes into use relatively late and yet it has faster data transferring speed. Different SATA versions provide backward compatibility, which means higher SATA interface version is compatible with lower version. Some SATA hard disk provides jumpers, and different settings of jumper makes different SATA interface version number of same hard drive (mainly data transfer speed difference). As a matter of fact, the actual data transfer speed largely depends on motherboard. For instance, many computer motherboards do not support SATA 3, and in that case the data transfer speed of SATA 2 and SATA 3 won't have obvious difference. SSD also comes with SATA interface, while some SSD uses mini-SATA (mSATA) interface, especially when it is placed in laptop. Mini SATA is about three-quarter of the size of a traditional SATA interface, so this is more suitable to laptop. When you see a hard drive with PATA interface, do not take it as a spelling mistake. PATA is a kind of hard drive interface which differs from SATA. What's the difference? The letter "P" of PATA represents parallel and "S" from SATA represents "serial". SATA is developed on the basis of PATA and PATA is rarely used for the moment. Normally, to ensure performance and quality, many technologies and devices used on server are different from PCs, which also includes hard drive interface. Server hard drive uses SCSI instead of IDE or SATA. On account that this tutorial primarily serves average users, thus SCSI won't take too much space here. All you need to know about SCSI are three points: 1. SCSI is mainly used by server hard disk; 2. SCSI interface has better performance; 3. SCSI hard drive is expensive. SAS is one of the recent versions of SCSI, which develops based on SCSI and performs data transfer via serial communications. SAS offers better performance which not only reflects in speed. Currently, SAS hard drive has small market share of server hard drive, but this might be the beginning of the trend. FCP (Fibre Channel Protocol) interface provides improved performance for high-end server field. FCP hard drives adopt fibre channel technology, which greatly increases transfer speed and improves other features. FCP hard drive applies to high-end server field that requires higher performance. To sum it up, this chapter introduces hard drive interface, including IDE, SATA, mini SATA, PATA, SCSI, SAS and FCP. This article is the third chapter of the entire tutorial series, and the first three chapters cover basic information about hard drive, and next article we'll go into another topic about using hard drive: partition table.